PRODUCT: The MotoZ tire comes via Australia and is the fruit of dyed-in-the-wool hard-core enthusiasts. Their line of tires includes adventure, enduro, MX and hybrid knobs. They are manufactured in Thailand at a privately owned factory (for over 40-years) and are the only off-road tires made by the factory. So, when we called asking about a good sticky off-road tire that would work well in sand and hard and loose rocks, they pointed us towards the Arena Hybrid. They offer two compounds—standard and gummy, For our needs we went with the standard model. It’s slated as an MX/trials hybrid, meaning that the carcass is trials based (flexible) and the tread design comes from their M- based Terrapactor. 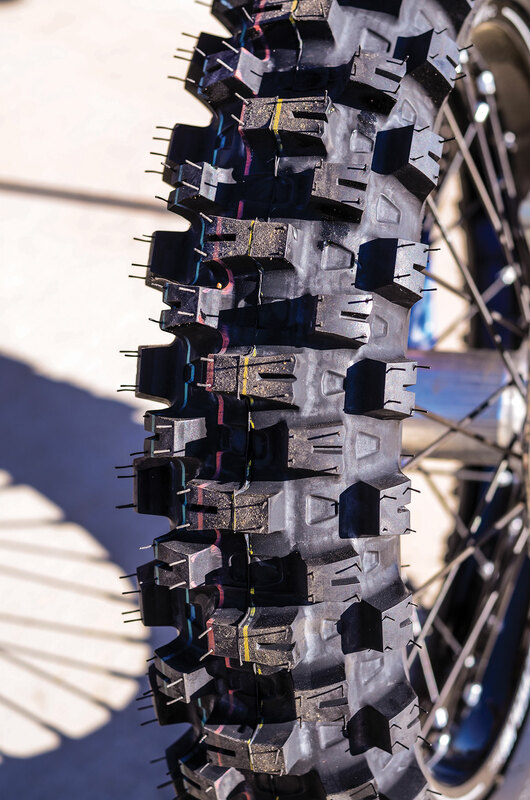 They focused on keeping weight down, while the flex in the carcass allows the tire to bite and the knob pattern chews on a variety of terrain, including all the ingredients that we wanted. OUR TAKE: First off, the knobs feel quite flexy even though this was the standard compound. We fit ours (a 120/90-18) onto a KTM 300 TPI and spent over a month testing in the high desert of SoCal. It’s interesting terrain in our stomping grounds, as the dirt ranges dramatically from sand hills to hardpack woods trails and a good chunk of cobby, rocky junk. The MotoZ Arena Hybrid has an odd-looking, staggered knob pattern but does a superb job of handling a myriad of soils. We got excellent traction on the sand hills; on technical rocky trails the contact patch was superb and allowed the bike to make traction and hold a line. We felt a kind of float at times, usually at higher speeds, and put it down to the soft, flexible carcass. For faster stuff we upped the air pressure (for most trail work we run 10 psi with a thick tube) to 12–14 psi, and this helped the rolling feel. 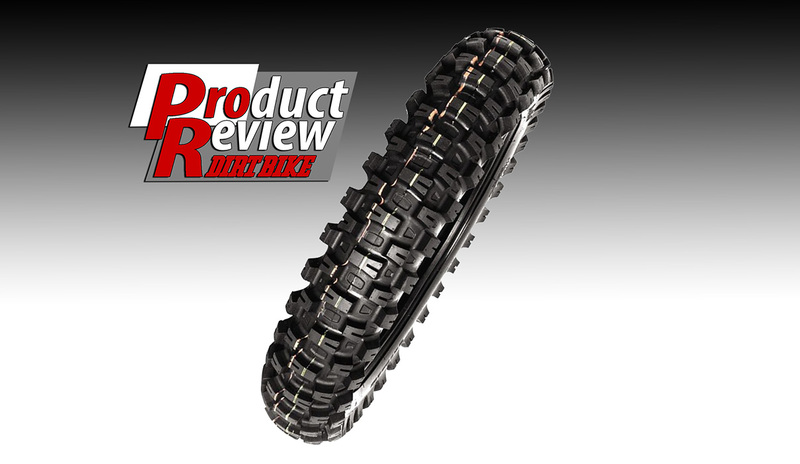 Still, this tire offers superb bite, it acts like a tall side-walled trials tire on obstacles, rocky sidehills and technical terrain where you really need it to hook up. And, one big benefit was durability. After 150 miles of trail time, it still looks strong! This can’t be said of other sticky-styled rear tires that we’ve tested in the same area. The bottom line is that for technical trails, a smattering of hill-climbing and rocked-out rutted singletrack, it’s right at the top of our favorites.